On Friday 12 October 2012, Surinder S. Jodhka, Professor of Sociology at the Centre for the Study of Social Systems, School of Social Sciences at Jawaharlal Nehru University (JNU) in Delhi, was installed as the third Visiting Indian Council for Cultural Relations (ICCR) Professor at Lund University. He is hosted by the Department of Political Science during the academic year 2012/13, till June 2013. 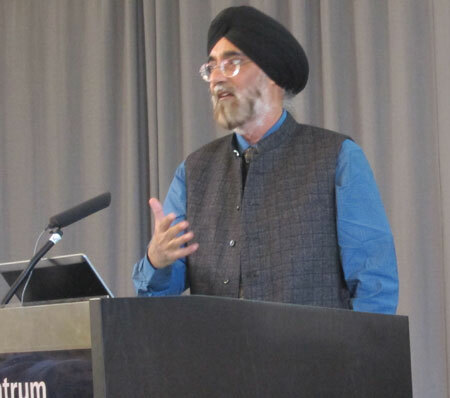 An installation ceremony was organised at Lund University’s Palaestra auditorium, where Professor Jodhka gave an inaugural lecture on the theme ”Indian Village in the ‘Neo-Liberal’ Times: Changing Economies, Power and Identities”. The informed presentation was based on field work he has carried out in the rural areas of Haryana state in north India. The audience consisted of an interested crowd of Lund University researchers, students and others. 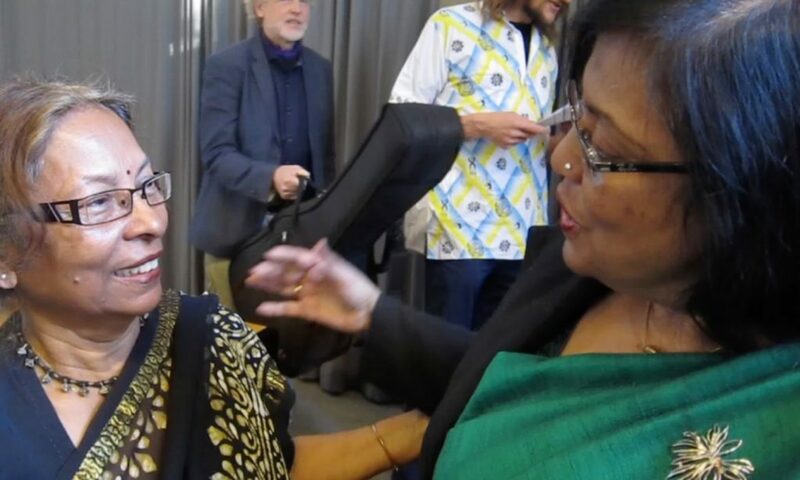 His lecture was preceded by a presentation by the Indian Ambassador to Sweden and Latvia, Ms. Banashri Bose Harrison, who had come to Lund specifically to participate in the installation ceremony. Introductory speeches were also given by Professor Tomas Bergström, Dept. of Political Science, and by Dr. Anna Lindberg, Director, SASNET. The seminar ended with a short cultural programme with the Indian Choir of Lund, led by Bubu Munshi Eklund. Listen to the Choir singing He Notun by Rabindranath Tagore, and Mahatma Gandhi’s favourite tune Raghupati Raghav Rajaram. The ICCR professorships at Lund University are an outcome of a Memorandum of Understanding between ICCR and Lund University, that was signed on 22 June 2010 by Mr. Balkrishna Shetty, former Indian Ambassador to Sweden, and Prof. Per Eriksson, Vice-Chancellor, Lund University. The agreement is valid for four years, with a new Indian Professor to be selected each year. SASNET was actively involved in finalizing the ICCR professorship at Lund University, with strong support from the Embassy of India in Stockholm. Key persons at the installation seminar for Professor Surinder Jodhka (third from left). 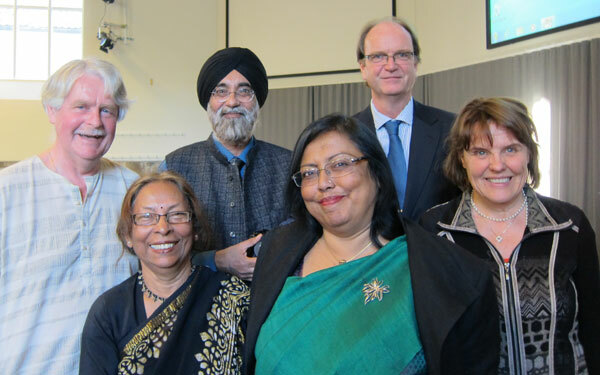 Mr. Lars Eklund, SASNET; Mrs. Bubu Munshi Eklund, Lund India Choir; Mrs. Banashri Bose Harrison, Indian Ambassador to Sweden; Prof. Tomas Bergström, Dept. of Political Science; and Dr. Anna Lindberg, SASNET. Professor Jodhka is the third Visiting ICCR Professor at Lund University, after Professor Lipi Ghosh 2010/11, and Professor G K Karanth 2011/12. More information on the ICCR professorship. Besides his position as Professor at the School of Social Sciences, JNU since 2006, Surinder Jodhka is also a Honorary Fellow at the Indian School of Political Economy in Pune, and during the period 2008–2010, he was the Director for the Indian Institute of Dalit Studies. For five years he was Country Coordinator for the Religions and Development Research Programme, coordinated by University of Birmingham, UK. Previously he has been a Charles Wallace India Trust Fellow at Queens University in Belfast; South Asian Visiting Scholar at University of Oxford; Honorary Visiting Fellow at University of Wisconsin, Madison; and Visiting Associate Professor at University of Bergen, Norway. Besides, Prof. Jodhka has been member of several editorial boards for journals such as Sociology (official journal of the British Sociological Association); Sikh Formations; and Sociological Bulletin, Journal of the Indian Sociological Society. His areas of specialization are Political Sociology; Social and Cultural Identities in contemporary India; Development Studies; Social Stratification; Rural Society and Agrarian Change. Recently published books are ”Religions, Communities, Development: Changing Contours of Policy and Politics in Contemporary India” (edited with Gurpreet Mahajan): Routledge, New Delhi, 2010; ”Village Society: Culture, Politics and Social Life in Rural India”. Orient Blackswan. Edited, 2012; and ”Changing Caste: Mobility, Ideology, Identity”. Sage Publications, New Delhi. Edited, 2012. The most recent publication is a book entited ”Caste: Oxford India Short Introductions” published by Oxford University Press in July 2012. Go for Prof. Surinder Jodhka’s complete CV.